Time has come to start preparing the second instalment of the Cypress Branches trilogy for publication. At the moment, there’s no firm publication date set, but I’m aiming for some time between November this year and March next year. I know, it’s a very wide window, but I need to see how things go before setting a firmer time. It would be nice to hit the November deadline (for more than just the obvious reasons), but I’ve got to be realistic and consider the fact that it took me nearly three years to get the first part ready to print. And now I’ve got to get part two ready whilst keeping everything going with Pegasus Falling. As much as I’d love to consider this my full time job, the truth is that I’m not Amanda Hocking or Kerry Wilkinson and a real job will beckon soon…so I must spend what time I have before the world of work calls me back making sure that as much as possible of the labour intensive work on It Never Was Youhas been done. Having already launched Pegasus Falling and gone through the aches and pains that is self-publishing a novel, you’d think that doing it again would be a piece of cake, wouldn’t you? Well, truth be told, I’m kind of dreading it. 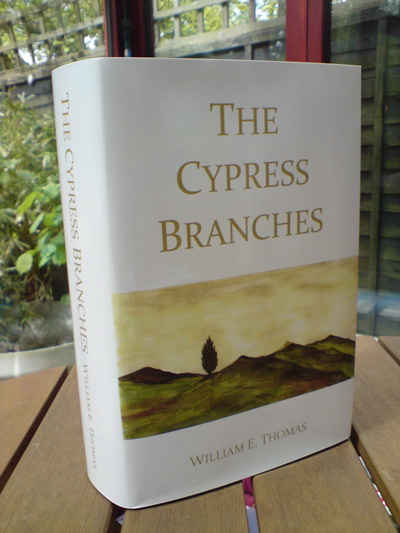 For those of you who don’t know, William wrote The Cypress Branches as one large work. Not quite Lord of the Rings or War & Peace, but big enough to make it a substantial tome. It was an incredible feat, and one which took over his life for a significant portion of his retirement. It made a beautiful hardback, but was totally uneconomical to produce in its entirety as a paperback in its full form and the idea of producing a trilogy of paperbacks first came up on the day we launched the hardback way back in 2009. With its episodic format, being split into six “books” and with the action passing from one set of characters to another, it appeared at first glance to lend itself perfectly to splitting into smaller chunks. A trilogy would surely be easy enough to pull off…with two “books” making up each part of the trilogy. There’s always been a major problem with doing that though. And that’s that the action in The Cypress Branches starts with one set of characters (Harry and Mary) for the first five chapters, then abruptly switches to the second set (Sammy, Naomi and Lesley) and stays with them almost constantly until the end of book two, with hardly a mention of Harry and Mary again until book three begins. The reason for this becomes clear the further in to the book you venture. So, problem solved with Pegasus Falling, but by cherry picking the chapters to include in that book, I have left myself with some burning questions and problems when putting together book two. There are several loose ends which need tidying up. That’s not to say It Never Was You will be inferior to Pegasus Falling – in fact, in my personal opinion, Harry and Mary’s story is equal to, if not more emotional than Sammy, Naomi and Lesley’s – it just means that I have to make some decisions – some hard decisions in some cases – about how to thread some parts together. As with Pegasus Falling, some sections may need to go. Others will need a bit of polishing. And I have to make sure that I don’t let emotional attachment get in the way. And without William there to discuss these problems with, it’s a heavy responsibility. I said earlier that I was dreading this. That’s probably a little disingenuous. I’m probably looking forward to it more than dreading it – it’s just that there are some difficult choices to be made, choices which I would have much preferred to make in consultation with the author. I’ll blog more about that soon, but in the mean time, I need to knuckle down with the manuscript and familiarise myself with Harry, Mary and the Liverpool docks, the main setting of this particular piece of the story. Yeah, ok, I am looking forward to it. It’s been a long time since I read this part of the book, and I have very fond memories of the characters. It’ll be good to see them again.